The group, which works for law enforcement advisory company Strategic Policy Partnership, will be in Oakland for six months. Though the company is based in Massachusetts, its consultants hail from East Coast states including New York and Florida. Strategic Policy Partnership has previously advised other big city police departments, including those in Detroit, San Francisco and Los Angeles. Advising will occur in two phases—first, the group will determine a short term crime reduction strategy, including implementing an expanded version of CompStat, a program through which crimes are mapped so law enforcement officials can see where patterns occur and allocate resources to the areas with the highest crime rates. Phase two will focus on the community’s role in crime reduction and will involve numerous interviews with neighborhood groups and city officials, as well as a community review of the proposed crime reduction strategies. In a four-part series that will be published over the next two weeks, Oakland North will look at why the consultants were brought in, who makes up this new group, how Bratton became a big name in policing and what issues residents think the consultants should tackle first. So far, reactions to the hiring of the consultants have been mixed. The council approved the contract 7-1, with Councilmember Desley Brooks (District 6) casting the only vote of dissent. She pointed to the group’s high price tag, which must now be paid in addition to the fees from other previous contracts for the police. Religious leaders threw their support behind the consultant group, with many members of the clergy attending the January 22 city council meeting at which the contract was up for vote. They emphasized that they wanted to try something different to try to stop the violence in Oakland. But other Oakland residents, including Adam Blueford, whose 18-year-old son Alan Blueford was shot by an OPD officer last May, expressed concern about policing tactics like “stop-and-frisk,” which Bratton has encouraged in other cities. Stop-and-frisk allows an officer to stop someone suspected of being involved with a crime and frisk the individual if the officer feels there is reasonable fear of injury. Critics fear this could lead to racial profiling and the use of unconstitutional policing tactics in Oakland. Once they begin their work in mid-February, the consultant group’s foremost priority is to address the rising crime rates in Oakland. According to statistics released by the Oakland Police Department, Oakland’s murder rate increased 22 percent from 2011-2012. In 2011, there were 103 homicides. Three of these victims were under the age of six—a saddening statistic that stood out from other years. One year later, the total number of homicides jumped to 131. Burglaries increased by 43 percent and robberies went up by 24 percent between 2011 and 2012. Mayor Jean Quan has attributed the rise in crime to the low number of police officers—today, the department has 613 sworn officers. In 2010, the last year of former Mayor Ron Dellums’ term, there were 839. During this year, crime in nearly every category fell to its lowest rate in four years, according to crime stats released by the OPD. “Whether you like it or not, when we had more police, crime was down,” Quan told the crowd at the January 22 council meeting. But at the meeting and since, some Oakland residents have expressed concerns about Bratton’s past endorsement of stop-and-frisk in Los Angeles and New York, where he served as police commissioner. Some Oakland residents said they were worried that the tactic will encourage racial profiling, a practice in which law enforcement officers stop individuals based on their ethnicity, religion or national origin. City officials have reacted to worries that stop and frisk will be used in unfair ways. He also released an open letter to the community, in which he wrote that the police department and the city of Oakland “firmly and unequivocally stand with our community against racial profiling.” In the letter, he said that OPD officers will continue to stop or arrest those they believe have committed crimes and search for weapons or contraband when legally allowed to do so. But he said an officer’s “professional demeanor” and “patience” can make a difference. Some of the firmest support for the hiring of the consulting group has come from Oakland’s clergy, a group also heavily involved in the city’s Operation Ceasefire effort, which encourages former violent offenders to change their behavior. Several faith leaders voiced their support for Jordan and the consultant group at the January 22 council meeting. Among them was Pastor Gerald Agee of Friendship Christian Center International in Oakland. In a phone interview last week, Agee described a scene experienced by a fellow pastor in his group, Pastors of Oakland—an organization of religious leaders who support each other and plan anti-violence marches and initiatives—that illustrates the prevalence of violence in Oakland. Agee’s fellow pastor heard gunshots outside of his business and opened his doors to find a 19-year-old man with gunshot wounds in his chest, Agee said. The pastor stooped down to try to stem the blood and shouted for help, but the man died in his arms. Quan feels the panel must also address is a lack of community trust in the police. This partly stems from fallout from the “Riders” trial, in which a group of four veteran Oakland officers, who called themselves the Riders, were accused of planting evidence, making false police reports and beating suspects. As part of the 2003 settlement, the Oakland Police Department was assigned a federal monitor to ensure the department carried out 51 reforms, ranging from the management of police internal investigations to improving a computerized system to track at-risk officers based on data like sick leave and involvement in officer-involved shootings. The department was threatened with being placed into federal receivership if it did not complete the reforms. In December, federal judge Thelton Henderson approved the hiring of a compliance director, rather than a federal receiver, to finish out the final three reforms. Stanford law professor Robert Weisberg, who has been following the Riders case closely, said the community’s mistrust of the police is probably twofold: They don’t trust that the department can keep their children safe from violence, and they don’t trust officers to be fair when they abuse innocent people or legitimate suspects, he said. That’s the hope of residents like Agee. 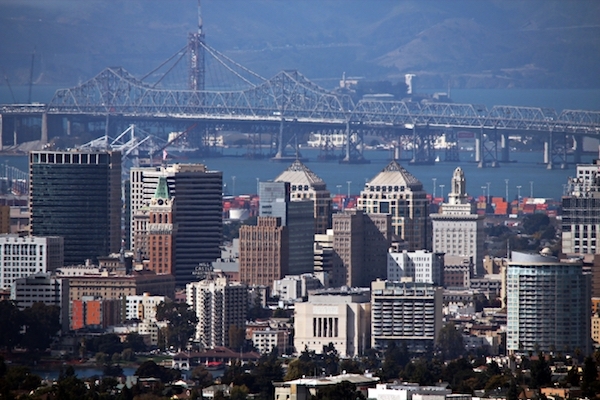 An independent consulting group will advice the Oakland Police Department on strategies for crime reduction. I don’t know why the press is not pointing out that “stop and frisk” has been legal for 50 years. The “reasonable suspicion” boundary for stopping someone was well-established in the 60’s in the Terry case. Thus, we all live under “stop and frisk” and have been for years. It’s not new. However, some groups have a valid concern that with Bratton, it will be overemphasized and racially biased. Instead of protesting his appointment, we should be engaging with him and the rest of the oversight team to ensure we all get the protection we need from the rampant crime AND civil rights are protected.